SEE YOUR VIP PICTURES HERE! Come join in the celebration with Countdown to Kickoff's hosts David Greene, Jon, and Matt Stinchcomb along with former and current Dawgs. Held at the Maggianos Buckhead Location in Atlanta, enjoy the fine cuisine of Center Stage Catering and beverages at the open bar provided by Georgia Crown and Savannah Distributing Companies as you get to know the players, take a shot at winning exclusive items in the silent and live auctions, and witness the presentation of the IMPACT and Legacy awards for 2010. To attend the Awards Party and Auction Night please click on the "Sponsorship" tab at the top of the page for details. The IMPACT Award is in recognition of the Georgia football player that has best demonstrated a commitment to their community in addition to their teammates and schoolwork. The IMPACT award recipient will have $2,000 donated to an University or Athens-area charity in their name. Two other current team members will also be recognized for their efforts with $500 going to charities of their choice as well. The Legacy Award honors those who have loyally and generously provided resources to the University of Georgia as well as community and charitable efforts. The Legacy award acknowledges their sustained, dedicated, self-less contributions to causes near to their heart, and their earnest support of organizations that address the various needs of our society. Dawg for a Game Day: Not just any day, but gameday! Do everything the Dawgs do except play in the game. 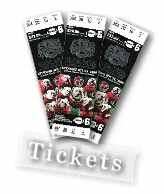 Ride with the team to Sanford stadium, do the Dawg Walk and join the team on the field during pre-game warmups. Meet the Press: 2 Lucky fans watch the Dawgs take on the Vanderbilt Commodores like members of the media...from the press box! See the action the way Larry Munson sees it, and maybe bump into your favorite T.V. analyst. Also attend Coach Richt's postgame press confernece. Includes admission and pre-game press meal in the box. "G-E-O-R-G-I-A" : Be the Band Leader at Halftime. All eyes are on you as you join the Redcoats on the field and lead them in the spelling of Georgia, you'll be shown on the big screen so be sure to practice! Run with the Dawgs: The only time you actually want to be treated like a Dawg. Spend a day with the team, run and lift weights coached by the Georgia Strength Staff just like your favorite players. You're in the DawgHouse: Get a behind-the-scenes look at how players prepare for practice and tour UGA's state of the art training and locker room facilities. Memorabilia: Got Shelf Space? How 'bout some empty walls? Exclusive items ranging from Herschel to Favre, and more hard to get items signed by Georgia Greats like Jake Scott. 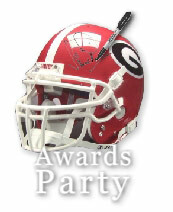 This year there will be some one-of-a-kind items available only at this event such as New England Patriots and Miami Dolphins helmets from their undefeated season signed by every UGA player on their rosters. And don't miss out on the unveiling of some UGA game jerseys you have never seen before and can't get anywhere else!!! !